The story of the woman at the well is a marriage proposal and is a great place to begin in sharing how we are treasures in earthen vessels. It is strangely reminiscent of the song we sang as children “first comes love then comes marriage then comes the baby in the baby carriage”. First there was God who is love. Then the word was made flesh. 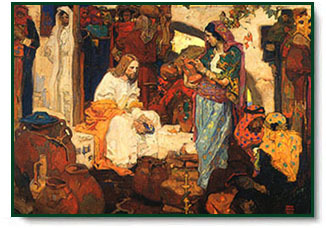 Jesus is the Bridegroom. That childhood song was a song about the holy Trinity and the call of our God into the marriage relationship of the bride and bridegroom and how we will be transformed into new creations. Theology of the Body gives us a beautiful lens from which to fully understand what the old Baltimore catechism said when it said we were created to know love and serve God to give you him forever in heaven. The woman at the well is symbolic of all of our brokenness because of the sin in our lives, all of the inadequacies and all of the ways in which we fall short and yet God comes to us and seeks us out. This is the marriage proposal. We are made for connection we are made for relationship. Where we struggle in this is when SHAME gets in the way of allowing others to truly see who we are or to allow others to truly see us. That’s where vulnerability comes in. VULNERABILITY IS NOT WEAKNESS. How many think it takes vulnerability to speak in front of an audience of 800 people? It is true that vulnerability involves emotional risk and uncertainty but what vulnerability really means is to have courage. Vulnerability is birthplace of creation and transformation. To create is to make something that never existed before like the unique and unrepeatable person. When we have the courage to really open ourselves to look into our hearts and even more importantly let others really and truly “see” us, we become transformed. “ Grace perfects our nature”. In the garden, we were naked without shame. “Naked without shame” is about knowing who we were as persons made in Gods image and likeness and our nature was perfect. When we fell from Grace due to original sin shame entered into the world. Shame is the devil’s proposal about who God is and who we are. Shame says one of two things; “you will never be good enough” or “who do you think you are”. Adam and Eve covered themselves because they said yes to the devil’s proposal. Because they were unwilling to be vulnerable enough to go to God and trust in who He said we are, they fell and the consequence was sin. Sin has its effects always in wounding. Sin always wounds. There is no sin that doesn’t wound. It wounds us and it wounds others around us. We have no possibility of living in this world without being wounded. What SHAME does is it takes the guilt we feel and turns the belief of “What I did was bad” into the belief that “I am bad”. SHAME then makes us feel that we are unworthy of connection. It is in believing we are not thin enough, beautiful enough, successful enough or smart enough that SHAME turns our focus from who we are as unique and unrepeatable persons into who we think we “should be” or “should be doing”. Shame makes us feel we are not good enough and that we will never be good enough. The story of the woman at the well reminds us of whom we truly are which is the beloved of the Bridegroom and that God desires to marry us. God knows all the places we have failed him and will fail him and yet he created us anyways. Out of all of the potential people God could’ve created we were chosen to be created and to come into the world to exist in fact of this very particular time in history. But it gets better than this! God is calling all of us to enter into the redemption of the world! God could have chose to redeem the world anyway he liked. What he decided was that he wanted all of us to enter into this great work with him. He does this by transforming our wounds much like his own were from the power of the cross. His “cracks” were in fact the greatest gift given to the entire world. Our wounds, our cracks, our inadequacies become the very place, once transformed like a firing kiln to a clay pot, becomes the very form from which God can best shine through, pour out of and be given to others. He is magnified by our smallness and our weakness. God is calling you and is issuing a marriage proposal in which He desires to transform you and touch the lives of those around you through your fiat. A treasure in earthen vessels is about our unique and unrepeatable personhood, it is about our immortal soul chosen by God to be called into existence. The earthen vessel reveals that the person we are is feminine or masculine and also is a sign that we are called to love like the trinity. But the earthen vessel also speaks to us about form. Our form is meant to be a visible sign of Christ to the world. It is not just our masculine or feminine person that our form reveals but it tells a story of the Bride and the Bridegroom. In Caryll Houselander’s book “The Reed of God” she uses three forms to reveal how Christ “shines” through our cracks”, The reed, the chalice, and the birds nest. The Reed grows on the riverbanks and must be cut with a knife and then hallowed out with notches cut into it to create its form. Some of our stories include this kind of shaping. We are cut and hallowed out. We may think that we have nothing to give, our brokenness, or even our sinfulness might make us believe that God could never possibly choose us. The woman at the well is a reminder that God does chose us and when we allow him to redeem us, it is as if we are pressed to the lips of the master and when His Spirit blows through the reed, lyrical music is created because of the hallowing out and the notches that had been cut. Some of our stories are like a chalice. A chalice is made from gold that has to be first hewn from the mud, then forged in fire before it can be poured into it’s mold. It then has to be pounded by a mallet to create its form. For those whose forming came from the succession of blows or from the purification of fire, they may understand that they are like Gold, that they are good, but they may not believe themselves worthy of greatness. It is the age-old question “Who do you think you are? If we remember that we are the beloveds of Christ, that He called us into being that we are His, then we remember who we are. A chalice is used to offer the great sacrifice of the mass. For those whose form is like the chalice, God desires to fill you with the water and blood that gushed from His sacred heart so that through your form you can pour Him out to a thirsting world. Finally, for those who are shaped like the nest of a bird, the soft downy feathers of a tender mother bird’s breast create the form. For those who may have been formed by loving parents, in a prayerful home and have no painful formation as part of their story the temptation could be to say that they do not have a unique or inspiring story. Those whose story includes love, fidelity and affirmation are not only hope and inspiration for the world but it also creates a person more fully capable of revealing Christ. This story is an example of how each of us is called to become tabernacles. We are to bring Christ to the world with our own hands and feet, with our own stories. Each of our stories is as unique as our fingertips, as unique as our personhood. We are the vessel and form helps us to tell the story of who Christ is and who we are in Christ. We should never underestimate the power of conversion to work through even the most broken of vessels. Lazarus is an example of just such a vessel. He was dead. A rotting corpse and according to chief mourners “stinking” and yet when Christ shone through Lazarus, an entire city and now every generation to come, was converted through his story and through his form. For me, my form is the reed. I have been hallowed out, whittled and cut into. The story I have to tell is of being transformed through my children and my husband. I’ve been able to identify specific attributes or virtues that God has helped to develop in me for each one of my children. For Maegan it was vulnerability, for Sara it was selfless love, for Elisha it was the need of affirmation, for Gabriel it was submission, for Annamarie it was long-suffering, for Mercedes it was Mercy, for Christopher it was joy, for Jonah it was perseverance. Each time I was cracked, wounded or cut into because of my sin or the sin of others, the enemy proposed a lie so to enter into my heart and bring me to a place of shame. Christ helps to expose the lies and bring healing to our wounded hearts and when we become vulnerable and allow Him in to truly see us, Christ transforms our wounds and they become like stained glass windows illuminating and radiating God’s beauty, God’s light, God’s truth to the world. They will know us by our joy they will know us by our love. In this year of faith we are called to transformation. The new evangelization is about allowing Christ to permeate us. We embrace our greatness when we dare to take what we know in our heads and connect it to our hearts. When we move from knowing God, to being in an intimate relationship with Him. When we allow ourselves to truly be seen and to really see the person God puts in front of us everyday is when we enter into one another’s story of redemption. God works through cracked pots, because His greatness is magnified in our weakness. The truth is that the enemy puts salt in our wounds because he is terrified that if we actually go into the wounds and bring Christ there with us, we would discover that when Christ redeems them, they become like jewels in the Crown of the creator. You are a treasure in an earthly vessel and your form reveals a call to love and to be loved from the bridegroom to His bride. All it takes is your “fiat” which is the greatest “I DO” you can ever utter.